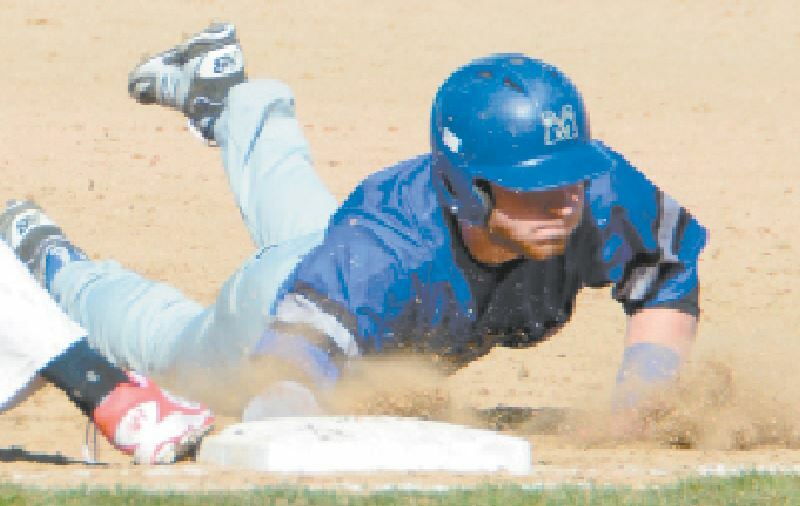 Courtesy photo by MARY PELRINE Merrimack senior Justin Grassini slides safely during the Tomahawks’ 4-1 loss to Spaulding on April 14. It was a tough outing for the Tomahawks in their first game of the season as the Astros rolled to a victory on April 12. It was tied at one going into the final inning of play on April 14 when Spaulding put up three runs on the board. Playing well for the Tomahawks were Justin Grassini (two hits), Jared Wells (two hits), and Tyler Rohr (one RBI). Starting pitcher Alex Thornton went five innings, giving up six hits, one earned run while striking out three. The Tomahawks had a five-run first inning Monday and didn’t look back. Showing off their bats were Tyler DeNeill (three hits, two doubles, one RBI, one run), Justin Grassini (two hits, two runs), Jared Wells (two hits, one RBI), and Alex Thornton (one hit, two RBIs). Starting pitcher Jake Mainey went three innings, giving up one hit, two runs, and striking out one. The Tomahawks had trouble Monday, only getting five hits. 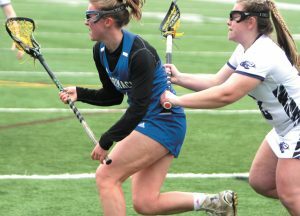 Morgan Peffer was 2 for 3, Demetria Gonzalez went 1 for 1, and Julia Valluzzi had one hit for Merrimack. Starting pitcher Mirnada Delibac took the loss on four strikeouts, three walks and three earned runs. Joey Paige had seven goals and an assist as the Titans evened their record at 1-1. Other scorers for North were Todd Redman (three goals, five assists), Troy Bottari (three goals, two assists), Brendan Martin (two goals) and Griff Masseur and Colin Manning (one goal each). James Petz had 11 saves in goal for North. Leading the way for Merrimack (0-2) was John Tiano with three goals and three assists, while Alex Bronchuk had a goal and three assists. T.J. Fasano had two goals and an assist while Ben Eichman and Jordan Petrocelli each had a goal. Garrett Murray had 14 saves in goal for Merrimack, with defensive help from Jason Theriault. Colby Benoit played his best match of the season at No. 6 singles thus far, going to deuce seven times before falling 8-2. Also playing well in defeat for the Tomahawks were Greg Keeler at No. 1 singles (5-8) and C.J. Terrenova at No. 2 (2-8). Winning in singles for the Cardinals (4-1) on Monday were No. 1 Claire Reynolds (8-0), No. 2 Sara Schmitt (8-1), No. 4 Margo Liakos (8-1), No. 5 Natalie Sheehy (8-0), and No. 6 Natalie Dionne (9-7). Bishop Guertin swept doubles competition with wins by No. 1 Reynolds-Schmitt (8-2), No. 2 Liz Janiak-Liakos (9-7), and No. 3 Mckenna Premus-Brittany Drew. Getting the lone win for Merrimack was No. 3 Abby Fay after she was down 1-5 and rallied.